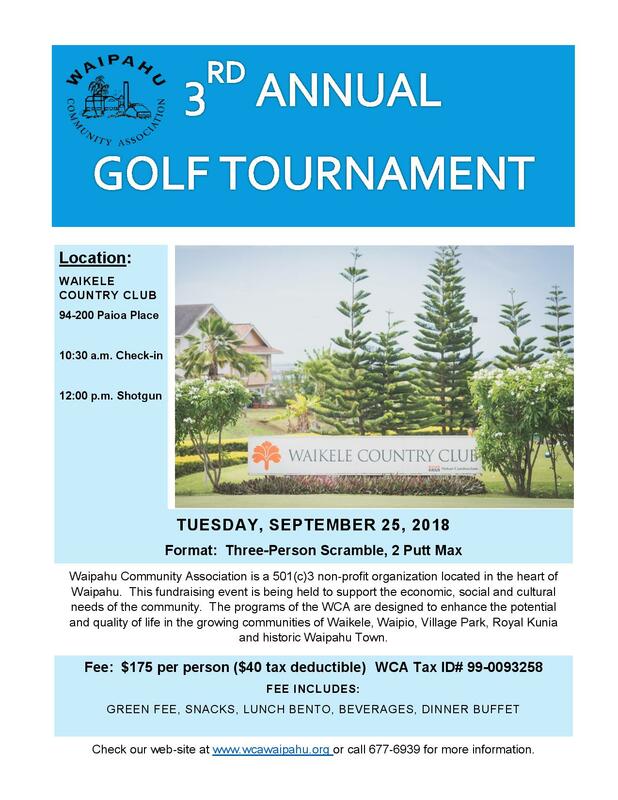 The Waipahu Community Association proudly announces our 3rd Annual Golf Tournament. It will be held on Tuesday, September 25, 2018, at the Waikele Country Club, 94-200 Paioa Place, Waipahu, HI 96797. Registration begins at 10:30 a.m. followed by shotgun time at 12:00 noon. This exciting Three-person scramble format is open to the public and is available to golfers of all abilities. The fee this year is $175 per person, with a tax deductible of $40. Sponsorships are available, please see application. Fee includes green fee, Lunch bento, snacks, beverages and the dinner buffet. Please call our office 677-6939 or see the flyer and application for more information.